In 2018, Silversea Cruises will offer year-round Galapagos cruises onboard the Silver Galapagos. Silver Explorer will offer two special exploration cruises in 2018 featuring Hawaii and Tahiti or Tahiti and Easter Island! Silver Whisper will offer two repositioning cruises between San Francisco and Auckland or Los Angeles and Tahiti. Book early for the best savings! A chilled flute of champagne welcomes you. Your personal butler helps you unpack. And in the open bars and lounges, people from around the globe mingle in an ambience that is sophisticated, yet casual and relaxed. This is the world of Silversea in the South Pacific. Ultra-luxury voyages that are intimate and all-inclusive. And now with Passport to Luxury, you can personalize your journey with an onboard spending credit to make it uniquely your own. Come let our smaller ships transport you to the South Pacific. Sail into small islands that define the word paradise. Ask our Silver Shore Concierge to craft your own bespoke tour. Then return at night to the gracious hospitality that reflects our Italian heritage, to the intimate camaraderie and international ambience . . . and to the unpretentious ease of an all-inclusive lifestyle. 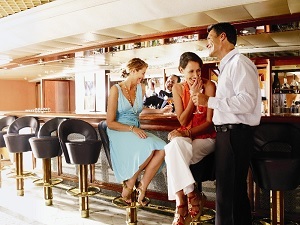 All-inclusive luxury has been the cornerstone of Silversea since the very beginning. Silversea Cruises offers a six-star luxury cruise vacation in Polynesia. The islands are among the most idyllic on Earth. Separated by vast expanses of ocean, the sub-regions of Polynesia include a broad range of environments from the massive mountain islands to deserted atolls and lagoons of fantasy. Located in a geographic area that extends over three million square miles, they support an incredible diversity of tribal cultures with an intriguing repository of ancestral traditions, and enough untouched natural beauty to last a lifetime. From the firmness of your mattress to the softness of your pillow, Silversea's highly personalized style of travel is readily apparent in the choices available in your suite. This is your home away from home, so customize it as you please. Your butler can arrange everything for you.